With all of the protesting that is happening lately (UC Berkeley, New York City, Philadelphia, etc) some of which has been peaceful, and some not, there is a united voice that on the surface appears to be one of insistence that President Donald Trump repeal his Executive Order which covers the recent travel restrictions from those residing in, or traveling from, one of the T7 Nations (Sudan, Syria, Somalia, Iraq, Iran, Yemen, Libya). While America is a nation made of immigrants, and while we embrace other cultures, in many ways the world's greatest "melting pot," every once in a while, for housekeeping measures, there needs to be a pause, or a reset. Now is one of those times. However, some, to be specific, the mainly the ones broadcasting anti-Trump Nazi rhetoric, placing "crosshairs" on images of President Trump, as well as those burning items in the streets or smashing windows, don't feel exactly this way. In fact, it appears that National Security is not even on their radar screen. Those participating in the "protests" or more specifically, riots, under the blanket of the 1st Amendment's protection of Free Speech, fail to realize that those protections are afforded to citizens of this great Nation, and do not extend outside it's borders. Moreover, there is a concerted and inherent risk currently among many nations to garner efforts to cause harm to the United States and Americans in general. We are, after all, on the same team least we forget. Despite the fact that as of this writing there is a temporary restraining order on the travel restrictions, this is not a victory for those hoping for porous borders and unrestricted travel into the United States. It is my opinion, this just paved the way for increasing President Trump's power, and this is why. 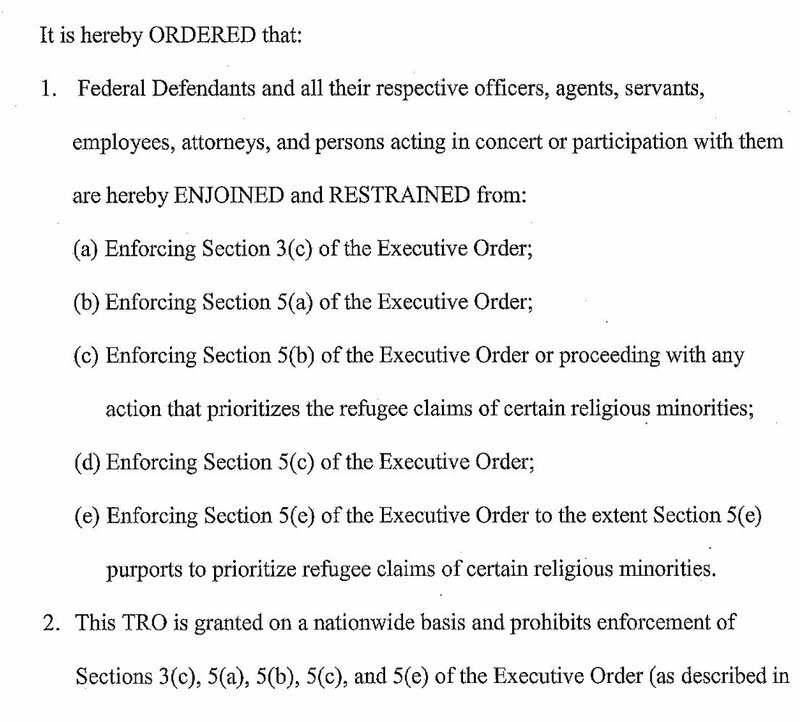 To begin with, the Executive Order stems from the Immigration and Nationality Act. Suffice it to say, National Security is well codified within the United States Code. 1. Executive Powers: The president has broad powers to manage national affairs and the priorities of the government. The president can issue rules, regulations, and instructions called executive orders, which have the binding force of law upon federal agencies but do not require approval of the United States Congress. 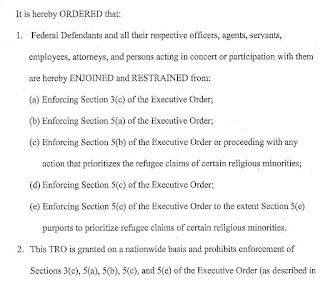 Executive orders are subject to judicial review and interpretation. 2. Powers Related to Legislation: The president has several options when presented with a bill from Congress. If the president agrees with the bill, then he or she can sign it into law within ten days of receipt. If the president opposes the bill, he or she can veto it and return the bill to Congress with a veto message suggesting changes unless the Congress is out of session then the president may rely on a pocket veto. 3. Powers of Appointment: Before taking office, the president-elect must appoint more than 6,000 new federal positions. The appointments range from top officials at U.S. government agencies, to the White House Staff, and members of the United States diplomatic corps. Many, but not all, of these positions are appointed by the president with the advice and consent of the United States Senate. The president also has the power to nominate federal judges, including members of the United States Courts of Appeals and the U.S. Supreme Court. However, these nominations do require Senate confirmation, and this can provide a major stumbling block for presidents who wish to shape their federal judiciary in a particular ideological stance. As head of the executive branch, the president must appoint the top officials for all of the federal agencies. 4. Executive Clemency: Article II of the United States Constitution gives the president the power of clemency. The two most commonly used clemency powers are those of pardon and commutation. A pardon is an official forgiveness for an acknowledged crime. Once a pardon is issued, all punishment for the crime is waived. 5. Emergency Powers: The Constitution does not expressly grant the president additional powers in times of national emergency. However, many scholars think that the Framers implied these powers because the structural design of the Executive Branch enables it to act faster than the Legislative Branch. Because the Constitution remains silent on the issue, the courts cannot grant the Executive Branch these powers when it tries to wield them. The courts will only recognize a right of the Executive Branch to use emergency powers if Congress has granted such powers to the president. 6. Executive Privilege: Executive privilege gives the president the ability to withhold information from the public, Congress, and the courts in national security and diplomatic affairs. 7. Foreign Affairs: Under the Constitution, the president is the federal official that is primarily responsible for the relations of the United States with foreign nations. The president appoints ambassadors, ministers, and consuls (subject to confirmation by the Senate) and receives foreign ambassadors and other public officials. With the Secretary of State, the president manages all official contacts with foreign governments. On occasion, the president may personally participate in summit conferences where heads of state meet for direct consultation. "The President has the power, and bears the responsibility, to make tough decisions at a moment’s notice—whether to trust fresh but uncertain intelligence, bomb an al-Qaeda safe house, target a terrorist for drone attack, or arrest a terror suspect. These decisions are not subject to legislative check or veto. Nor, in an age where a rogue state or stateless terrorist group may threaten the lives of million of Americans, could they be, if the safety of the nation is to be maintained. 4. The President of the United States to either sign into law, or veto. My hunch, is that the marked up bill will not be vetoed. This will grant the President the codified means to ban any person, persons, groups, or any other variation thereof that does not meet a "religious test" or some other Constitutionality issue. Thus to the chagrin of many of those protesting, setting fires, cheering the restraining orders... there is an end in sight. And that end, will be squarely on the center of President Donald Trump's desk whereby everything you have been protesting, will be signed into Law. And that is how it will likely go. To those protesting, or those on Team #Resist, while those efforts being made might be done so in the spirit of checking our government, keep in mind, that none of that matters if our National Homeland is attacked and we are once again living among the days of 9/11/2001.